I never read the magazines, I subscribe to, when they arrive. I let them build up, hoarders style, and then read several months worth in one sitting. The cooking magazines I get, I don’t keep. When I find an intriguing recipe, I just pull the page out and file it away. Once I make the recipe, I decide whether it deserves to make into my recipe box or it goes into the trash. 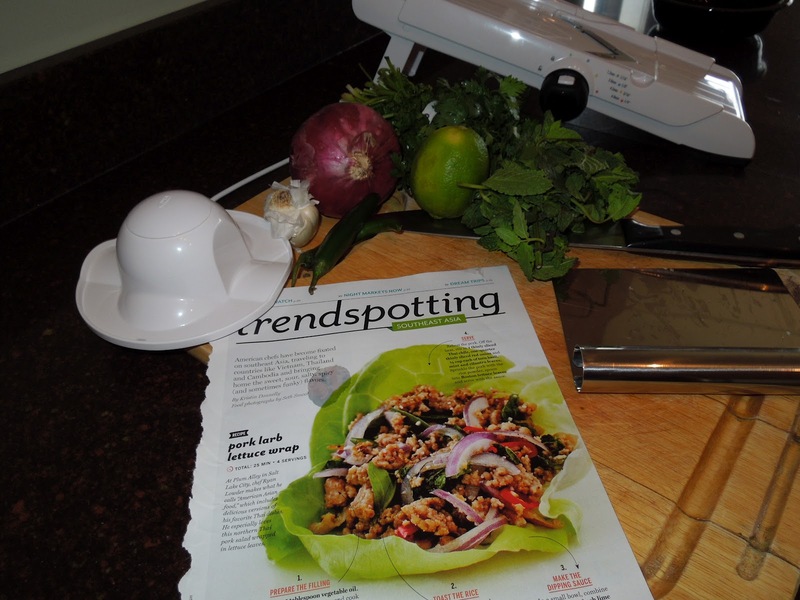 Last night I made a recipe from the August 2012 issue of Food and Wine called Pork Larb Lettuce Wraps. This recipe is from Salt Lake City chef Ryan Lowder. I am not familiar with Ryan (nor have I done any research on him). The one thing I did look up was the definition of Larb (a/k/a laab, laap, larp). Am I the only one who didn’t know what this is? 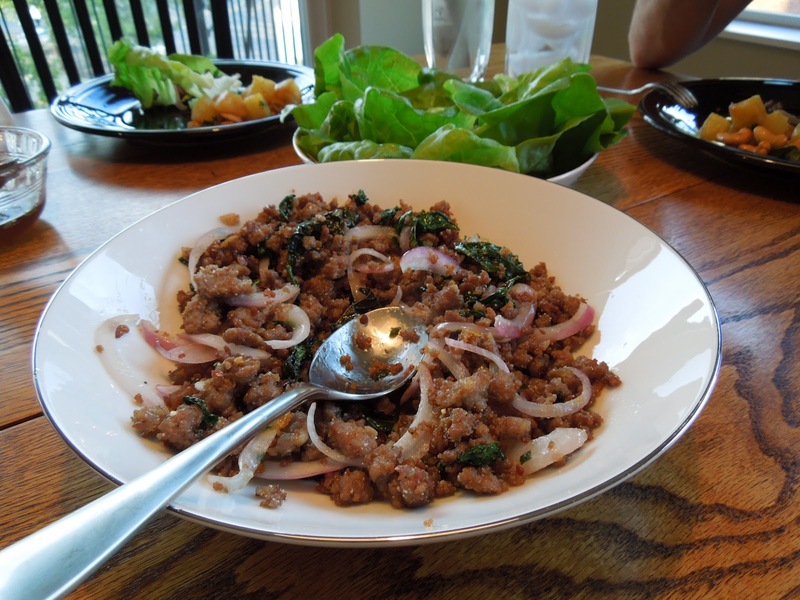 It is a Laotian (or northeastern Thai) meat salad. 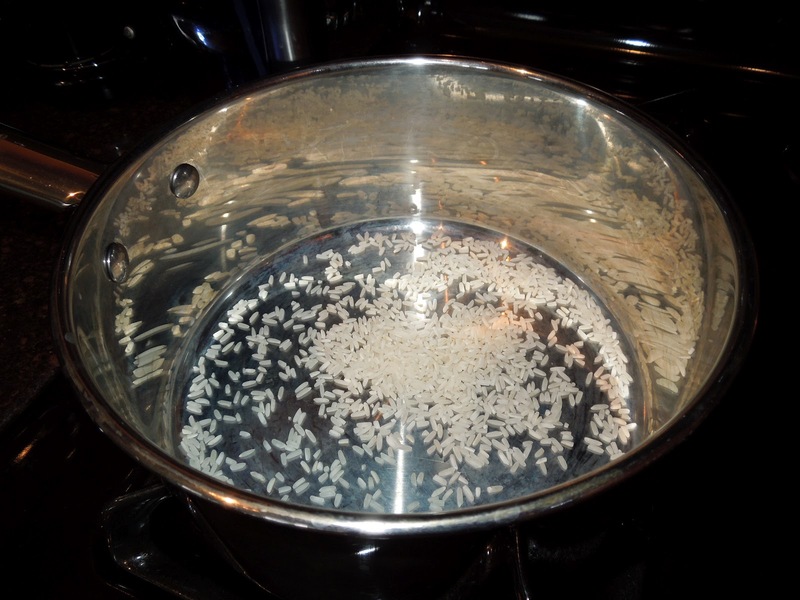 I chose this recipe because it is hot and we are planning a trip to southeast Asia next spring. Plus, I never make Asian food at home. Needed to try something new and this really fit the bill. The recipe was very easy to make and had just a handful of ingredients – most of which were already in my pantry. You can even make the larb early on then just reheat before dinner time (which is what I did). So, the real question, what did we think of the recipe? It was pretty damn good. The recipe had only tiniest bit of spice – I was expecting it to have a nice little kick, but not so much. I don’t use fish sauce all that much (read: never) but the sauce recipe was really mellow — not harsh at all (like the smell of the straight sauce). Would I make this recipe again? Absolutely! I would add a bit more spice/peppers to this recipe. I couldn’t find thai chilies at my grocery so I used serrano peppers instead. I would probably make a double batch of this recipe since you can easily re-heat this later in the week. Instead of using the larb in a lettuce wrap twice in one week, you could stuff it in a pepper or even a nice sweet onion. I made a Thai Pineapple Salad as a side with this as well — I will provide the recipe and a review of it later in the week. smokey flavor to the larb. What did you have for dinner Sunday night? Did you try a great new recipe? To beat the heat, what part of the world do you look to: SE Asia? Africa? India? South America? Do you use fish sauce more frequently than I do? By Tim in Food on July 23, 2012 .